2009 was an extremely busy year for Kristine and I and we didn’t really know the feasibility of trying to squeeze in another 7 summit. Between me studying, taking, and passing my professional engineering exam, Kristine and I preparing and planning our own wedding in October, me climbing Mt. Rainier again in June, Kristine & I attending several of our friends’ weddings all over the US, Kristine’s sister’s wedding in Maine, and our own engagement party in North Carolina, it didn’t look promising to get in another 7 summit this year. However, we were thinking of a Kilimanjaro trip for August before Kristine had to go back to school and our good friends Caleb & Jennie Wray were interested in going with us. We thought Kilimanjaro would be a pretty relaxed hike for us that wouldn’t require much planning. Jennie & I really could only take a week off from work and plans were set to essentially fly to Tanzania for the hike only and then fly back. But, when it came time to book tickets, prices were extraordinarily expensive and it was decided between all of us that the ticket prices were not worth only spending a week in Tanzania and only getting to see Kilimanjaro. 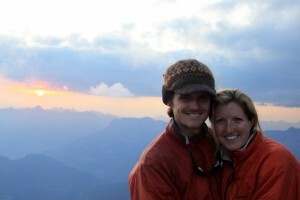 So, we aborted on Kilimanjaro and set our sights on Mont Blanc in the French Alps. I’ve always wanted to see the Alps and get to Chamonix and Mont Blanc and here was our chance especially with tickets to Paris being a third of what they were to Tanzania and the climb of Mont Blanc not taking an entire week. 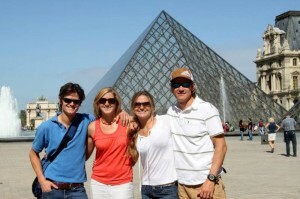 Tickets were purchased and Kristine & I met Caleb & Jennie in Charles de Gaulle airport in Paris. After renting a peugot and stuffing all of our gear in the trunk, we were able to navigate our way out of Paris thanks to Caleb’s fantastic racecar driving skills. I cannot drive stick and essentially all cars in France are stick, so I definitely lucked out as a passenger the entire trip. 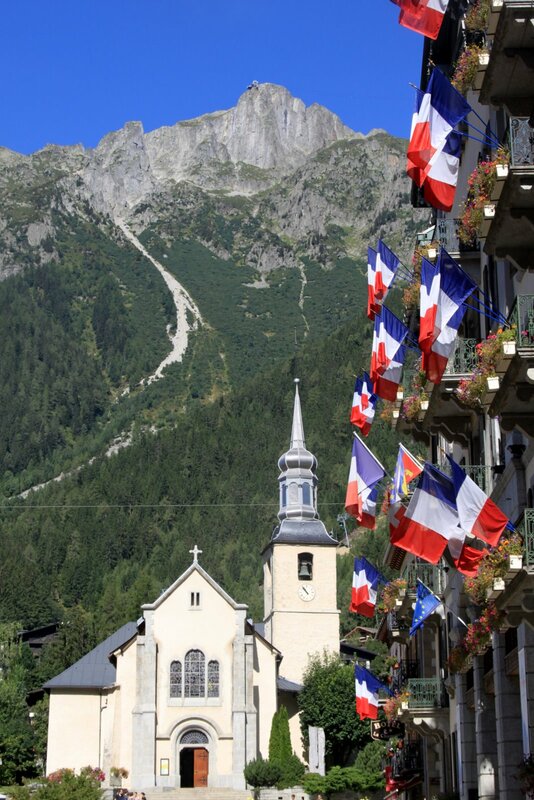 We took the less traveled route to Chamonix via the backroads and small towns of the Burghandy region of France. Burghandy is the wine region of France and it was so fantastic driving through this region with Kristine and good friends tasting wine and eating great food. We had our first lunch in the town of Austere, downed many gas station cappucinos, and made our way to the town of Beaune where we got a hotel room and spent the evening drinking wine and eating cheese and bread. These small towns of France are exactly as I had always imagined – cafes and shops of old french architecture lining cobblestone-covered streets. It was as if nothing had really changed in these places since they were built hundreds of years ago. On our 2nd day, we made our way towards Chamonix stopping along the way to take a short hike to several cascading waterfalls. We thought these would be off the beaten path, but wow what a tourist attraction. I felt like we were at Old Faithful in Yellowstone. We forgot we had picked the busiest month of the year to visit France when essentially the entire country is on vacation and hits the road. Nevertheless, after bypassing the tip of Switzerland and Geneva, we meandered through fantastic mountain passes and towns on edges of cliffs and found ourselves rolling into a campground in Chamonix late that night. The next mnorning we woke up in our tents and drove into Chamonix for a big breakfast and walked around town. Chamonix is like a Vail on steroids with much more dramatic mountains and steep cliffs surrounding the town. 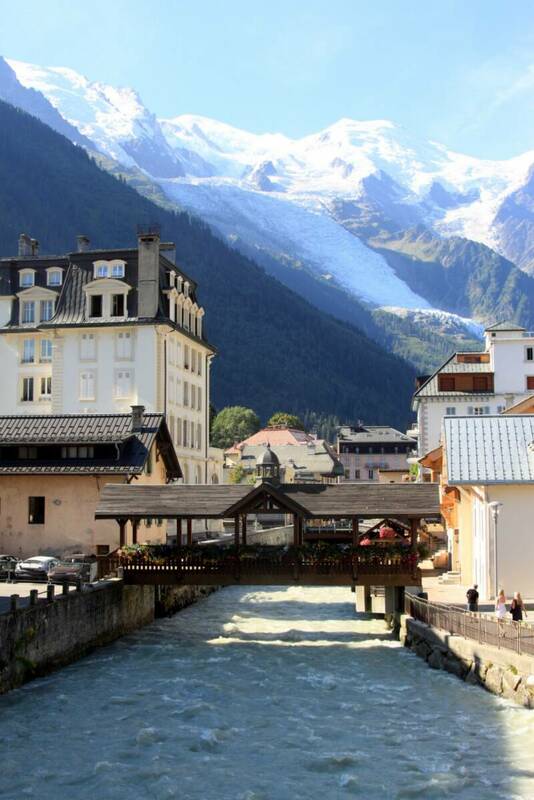 Chamonix is at an elevation of around 3,380′ and the Mont Blanc massif rises to almost 16,000′ and sits immediately adjacent Chamonix. So, you look up almost 12,500′ from Chamonix to the summit of Mont Blanc (15,780′)! Quite a dramatic vertical relief to say the least – greater vertical rise than anywhere in the lower 48 states. Anyway, we made our way to the Aiguille du Midi cable car station which would take us up to the top of the Aiguille du Midi at 12,500′ to begin our climb. 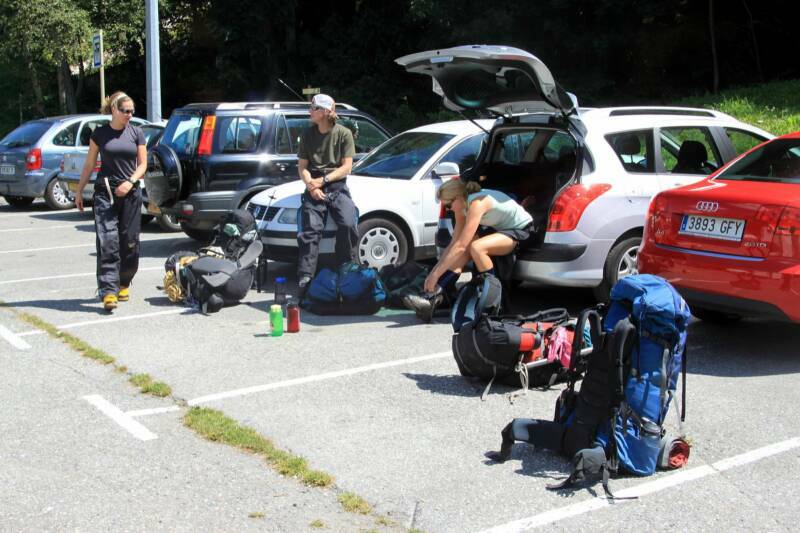 We parked the peugot and took a couple hours to pack all of our gear up in preparation for our climb. 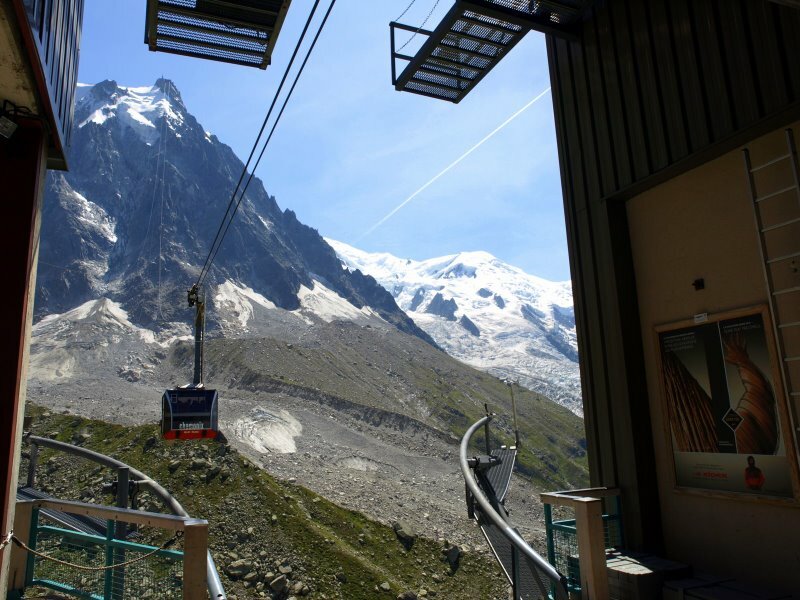 Without the significant aid of the Aiguille du Midi cable car, a climb of Mont Blanc would takle at least a week I would think. Instead, you can do it in one long day from one of the several permanent huts on the mountain. 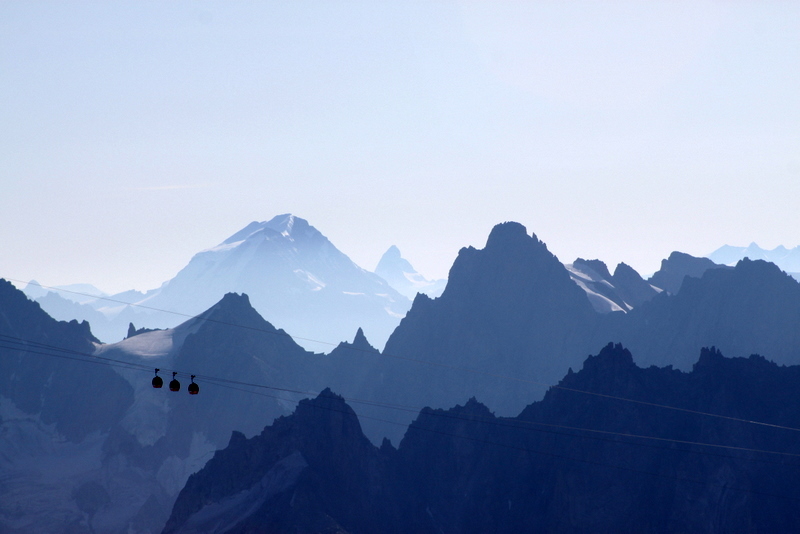 Riding the cable car did feel a bit like cheating, but the excitement of riding the Aiguille du Midi cable car pushed those thoughts aside. It was absolutely awesome and I’ve never been on such a thrilling cable car ride before in my life. It puts the Jackson Hole tram and anything else in the US to shame. The Aiguille du Midi cable car climbs at an astonishing 12 m/s and only takes about 20 min to climb 9,000′! My ears were definitely hurting because of the dramatic change in pressure in such a short time by the time we got off the cable car at the top of the Aiguille du Midi. The top station of the Aiguille du Midi was absolutely incredible with its tunnels blasted through the rock, amzing observation decks hanging onto edges of 3,000′ drops down to glaciers, and fantastic views of the surrounding Alps. 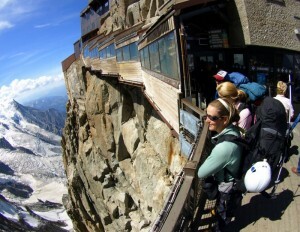 The french engineering of the cable cars, tunnels, and observation decks of the Aiguille du Midi blows my mind. We made our way through the tunnel to the exit marked “climber’s access”. We stepped over a gate and walked to a snowy platform where we donned our crampons and ice axes for the magnificent descent down a knife-edge snow ridge to the Col du Midi. Talk about excitement right out of the gate! 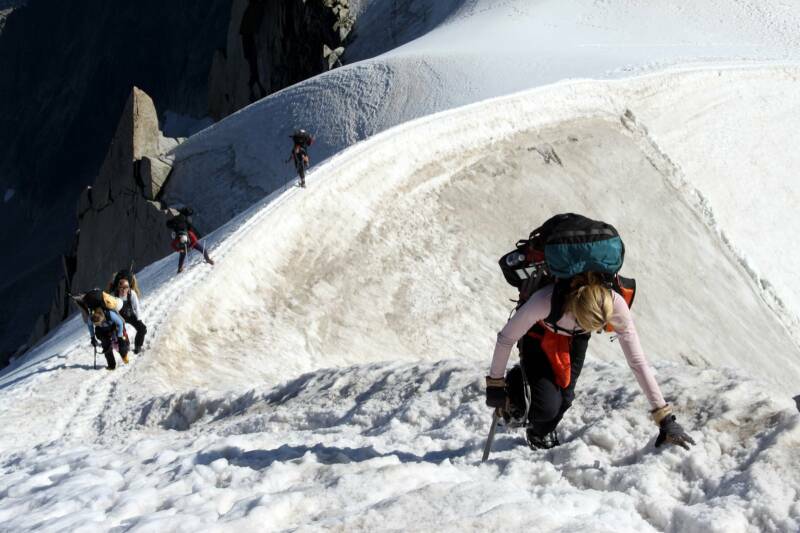 We felt it better to not rope-up because no protection was being placed and I went out first fairly quickly so that if climbers were coming back up to the Aiguille du Midi, I could stop them until our team had descended safely. The potential falls from this knife-edge snow ridge are likely all fatal if you cannot arrest your fall in the first few seconds. The ridge has good kicked-in steps, but its only 2 feet wide and has 50 degree plus slopes falling away on both sides. 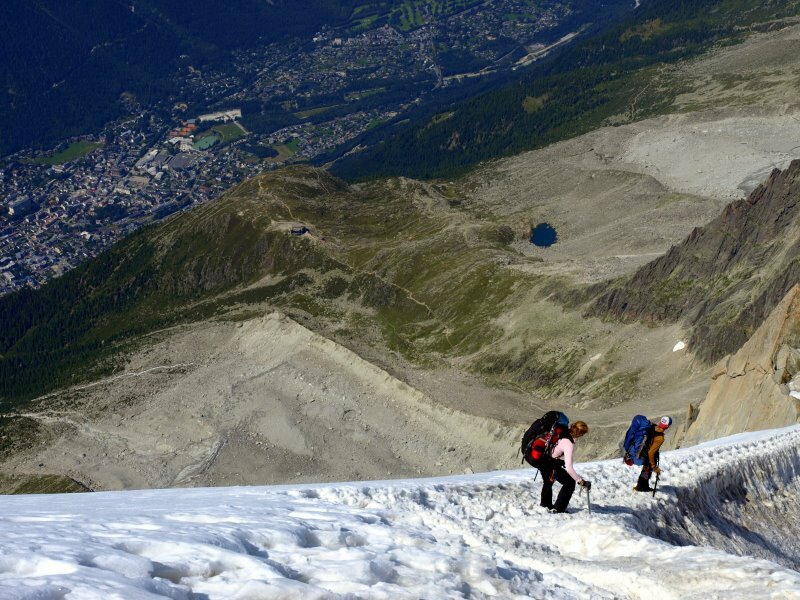 To one side lies Chamonix 9,000′ below with the 50-55 deg hard packed snow giving way to a bergschrund and a 4,000′ cliff while on the other side is steep snow and crevasses down to the Col du Midi 1,000′ below. Focus on your steps is crucial for descending and ascending this ridge safely. I cannot imagine that there has never been an accident on this ridge with the numerous climbers ascending and descending it daily and the fact that it has 2-way traffic on a one lane road. There is absolutely no order to it in that people start to come up as you are descending and at one point a climber used Kristine’s pack as a hand hold while bypassing around her! One very large group of climbers were getting ready to ascend the ridge while we were descending it, but luckily I got to them in time and halted their ascent until Kristine, Jennie, & Caleb got down to us safely. 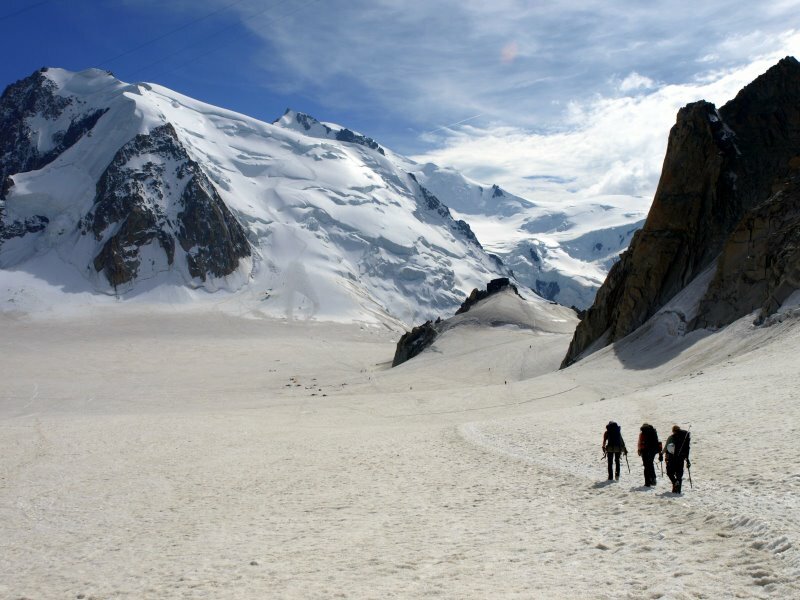 We then continued to descend, crossing a few small crevasses, on the well-beaten path down to our low point – the Col du Midi at around 11,500′. We traversed across the Col du Midi under the Aiguille du Midi and gazed up at all of the amazing rock routes on the Aiguille du Midi. Maybe another time we’d come back and bring our racks to climb some of these moderate, multi pitch rock climbs. We headed to the Cosmiques Hut at around 11,700′ where we had made reservations for 2 nights. Mont Blanc and our route, the 3 Mounts Traverse route, rose up in earnest behind the Cosmiques Hut. I think we were expecting the worst from this hut as our last international hut we stayed in was the Diesel Hut on Mt. Elbrus in Russia, which was about as bad as you would want a hut to get. But, it was as if we were expecting the Econo Lodge and we get slapped with a Ritz-Carleton Residence! The Cosmiques Hut was the nicest hut we have stayed in and reminded us of an upscale 10th mtn division hut here in Colorado only much larger and in a much more fantastic setting. There were climbers from all over the world here, some guided groups, and a few independent climbing parties including ourselves. Part of the hut was perched over a several hundred foot cliff and there was a fantastic deck overlooking Mont Blanc and Chamonix from which we enjoyed a spectacular sunset. The hut offered dinner for an additional fee, which most climbers paid for, but we had brought enough food for 2 dinners and our jetboils and pots, so we made our own dinner on the deck. One major thing that we did not know in coming to Mont Blanc was that you basically do not need any cooking gear, sleeping gear, etc for the climb as these huts have everything! All you need is your own personal clothing, technical gear (axes, crampons, rope, boots, helmet, etc) as the huts provide all your food, beds, restrooms, etc. No wonder all of the french climbers and others were looking at us a bit strange entering the hut with our large packs of gear, food, sleeping bags & pads, when everyone else essentially came in with a daypack. Anyway, we ate dinner, conversed with a british guide for an hour about climbing in the Alps, and then retired to our “1 am wake-up-call” bunk room. After a couple hours of snoozing and fading in and out of sleep, we awoke to multiple watch alarms beeping and everyone in our bunk room slowly got up and got dressed in their climbing gear. Breakfast downstairs was around 1:30am and entailed tasty bread, jam, cereal, and a “bowl” of coffee. Nothing can wake you up like a whole “bowl” of coffee! This wonderful breakfast was included in our hut reservation fee which was a nice feature. We knew it would be crowded on the route as people began to gear up and file out down to the Col du Midi, so we sort of lagged behind and waited for all the early risers to depart the hut. We then geared up with our harnesses, helmets, boots, gaiters, crevasse rescue gear, packed our packs, roped up and departed the hut. It was around 2:45am. We traversed across the remaining section of the Col du Midi over a few very small slots and began the long ascent of our 1st peak on the 3 Mounts Traverse route, Mont Blanc du Tacul. We chose the 3 Mounts Traverse route because we had read it was much less crowded than the more normal Gouter route albeit longer, steeper, and more technical. It looked like a much more interesting route and more challenging than the Gouter route, which was another reason we chose to climb this route. Its always sort of interesting and exciting climbing a mountain you’ve never been on in complete darkness, but there was a fairly well-traveled trail in the glacier we followed. 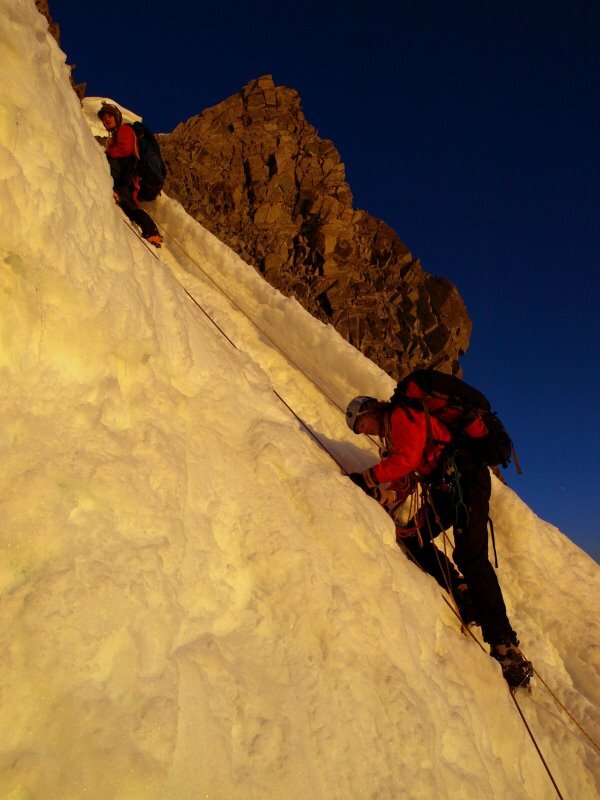 We climbed a few fairly steep sections and traversed under and above large seracs and ice cliffs until we topped out on a saddle at the top of Mont Blanc du Tacul at around 4 am. Clouds and fog began to roll in which made the route-finding in complete darkness pretty tough. We ran into a very large climbing group that was coming down as they had gone the wrong way. They then proceeded down another route which they thought was the correct route but we began to think it wasn’t as it descended too far down. We went the way we believed was corrrect and it tuned out it was and we never saw that large group of climbers during the climb again. We descended from the saddle several hundred feet and then began climbing the steep 45 degree snow to the 2nd peak on the 3 Mounts Traverse route, Mt. Maudit. This was a steep snow climb that crossed one very large crevasse via a snow bridge. We had caught up to several climbing parties by the time we had reached the bergschrund at the bottom of the route’s crux – a very steep 55 degree snow/ice headwall several hundred feet long with a technical rock pitch in the middle of the headwall. There were fixed lines up most of this headwall which all of the climbers utilized with their hands and/or mechanical ascender. By this point in the climb, the sun had started to come up and the views were amazing. We could see the lights of Chamonix over 10,000′ below in the dark valley. 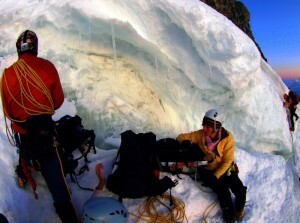 We climbed up and over the bergschrund and ascended the fixed lines with our ascenders safeguarding a potential fall. I made it to the rock pitch and free-climbed the pitch and 50′ of steep snow above it to the top of the headwall above and belayed Kristine up to me, then Jennie, and finally Caleb. We had made it to the top of the crux headwall and then made a long, exposed traverse across steep snow slopes over to the final saddle before the peak of Mont Blanc itself. Jennie was not feeling well at this point so she made the decision to remain at the saddle. We left her with a jetboil, food, down jacket, and she hunkered down behind a snow shelter wall that a previous climbing party appears to have built for a bivy site. 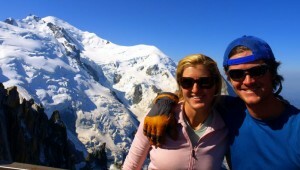 Kristine, Caleb, & I continued on and climbed the remaining 1,600′ to Mont Blanc’s summit at 15,780′. This remaining 1,600′ was the toughest of the climb as the wind was whipping at around 60 km/hr in our faces. We eventually made it to the summit about 1.5 hrs after we had left Jennie. It was around 9:45 am (about 7 hrs after we had departed the hut). We were all pretty ecstatic about being on top of the Alps and the wind on the summit wasn’t actually that bad. 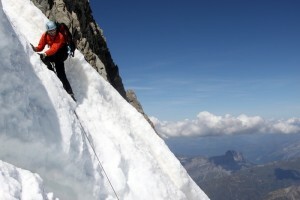 There were a few climbers topping out from the Gouter route. It was pretty spectacular standing on Mont Blanc’s summit gazing down to Chamonix and France on one side and down into Italy on the other. The Matterhorn in Switzerland could even be seen in the distance. We didn’t stay too long on the summit (maybe 20 min) as Jennie was waiting for us down at the saddle. We then departed the top of the Alps and headed down. Jennie was doing fine when we reached her and I think she felt a bit better. We then headed back across the long snow traverse to the top of the headwall crux on Mt. Maudit. There were a few fixed snow pickets in the snow at the top of the headwall supporting the fixed rope down to the rock pitch but they didn’t appear too supportive. Caleb & I both felt it safer and faster to just rappel the entire headwall in 2 long rappels instead of trying to descend the fixed ropes. Caleb placed his ice axe in as a 3rd anchor and I threw our 60m rope down. I then rappelled the rope down to the bottom of the rock pitch slacking out and freeing up the rope as I rappelled and then anchored myseld to a rap ring at the bottom of the rock pitch. Kristine, Jennie, and then Caleb all rappelled down to me and we all anchored in halfway down the headwall. Meanwhile, amongst all our rappelling, several other climbing parties threw down other ropes on both sides of us, rappelling them, kicking down ice chunks, and a few other climbers were even trying to climb up the fixed ropes at the same time. It was one of the most disorganized complete “shitshows” any of us had experienced on a mountain. It was definitely unsafe but we all decided speed is safety and to get down as fast as possible. Caleb & I then brought down our rope from above, slacked it out, and I threw it again down the remaining 100′ of steep snow/ice. I then rappelled down to the end of the rope and it was about 15′ short of the bottom of the headwall. I then attached my ascender to the fixed line and downclimbed the remaining 15′ over the bergschrund to the bottom. I then waved to Kristine above and she rappelled down. Everyone followed suit and made it down to me safely and we pulled the rope down. Glad to be off the headwall, we then roped back up together, and descended Mt. 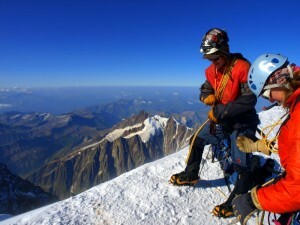 Maudit back to the saddle at the top of Mont Blanc du Tacul. We met a sponsored team of austrian “speed gliders” who were camped at the saddle and who were preparing for a summit attempt the following day. 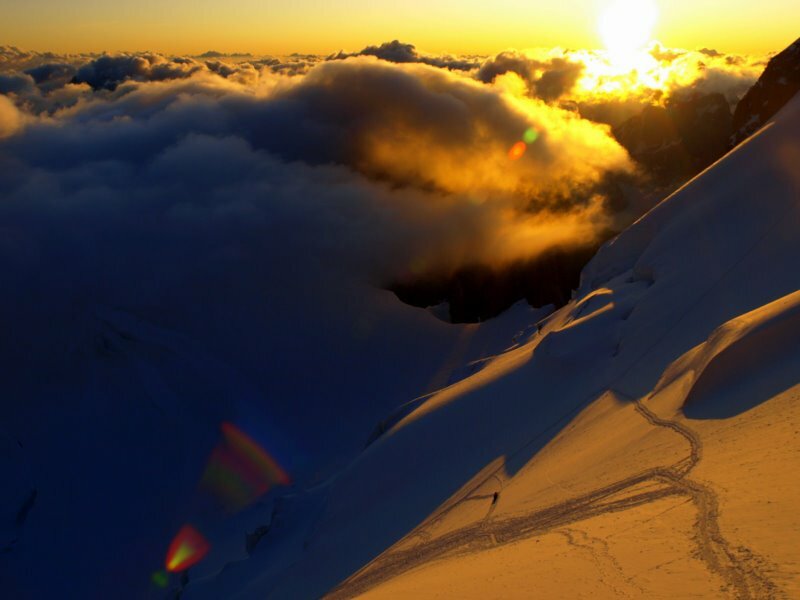 They would be bringing skis and a paraglider to the summit and skiing off the summit down to Chamonix taking off on their paraglider with their skies on! Obviously, the wind has to be right as well as other conditions, but they need the skis to propel them fast enough on their take off as their paragliders are smaller than normal. A very exciting and seemingly risky objective, but to each his own as always. The austrians were very nice people and we enjoyed conversing with them very much. It was funny that one of them thought rock climbing up the Aiguille du Midi was “crazy”, but then I thought “Bud, do you have any idea what you are about to do off the summit of Mont Blanc!” Pretty funny. I wonder if they were able to “speed glide” down to Chamonix…who knows. We eventually made it back down to the Col du Midi. It was about 4pm. The last Aiguille du Midi cable car left at 6pm and it was at least an hour up to the top of the Aiguille du Midi from the Cosmiques Hut, so instead of rushing to pack and climb up the knife-edge ridge, we decided to stay another night at the hut and relax. After cooking dinner, we hit the sack early and slept for 10 hrs. We woke up for the 7am breakfast the next morning and again had our “bowl” of coffee, bread, jam, and cereal….yum. We then packed up, donned our boots, crampons, and axes and traversed back across the Col du Midi and up to the knife-edge ridge. We waited around 30 minutes at the bottom of the ridge for several parties to descend and then we had our window to ascend back to the top of the Aiguille du Midi. Once back on the observation decks, we took several pictures of the 3 Mounts Traverse route and the surrounding peaks and got on the cable car for the 9,000′ ride down to the valley floor and Chamonix. The remaining 4 days of our trip were spent camping and traveling down to the Mediterranean Sea and the town of Cannes and then back to Paris for two nights and a day. It was great to get to the beach and see the Mediterranean Sea, but boy was it hot and the crowds of people were outrageous! Again, August is vacation month for the entire country but we found a nice spot on a pier and relaxed, enjoyed the sun and scenery, some diving into the ocean, and some cold beers. All in all, very quality time with Kristine and our good friends, Caleb & Jennie. Our drive back to Paris was nothing short of never-ending, but a few bottles of French Bordeaux and Jennie’s ipod full of 80s music really helped pass the time. Paris was amazing even with the whirlwind trip of the famous sights we did in the one full day we were there. Love to go back sometime and spend more time in Paris and Chamonix, but alas there are just too many great places in this world to visit. All in all, a fantastic trip to France and the Alps with Kristine and the Wrays. Mont Blanc was a great climb…better than I expected albeit longer than we anticipated. 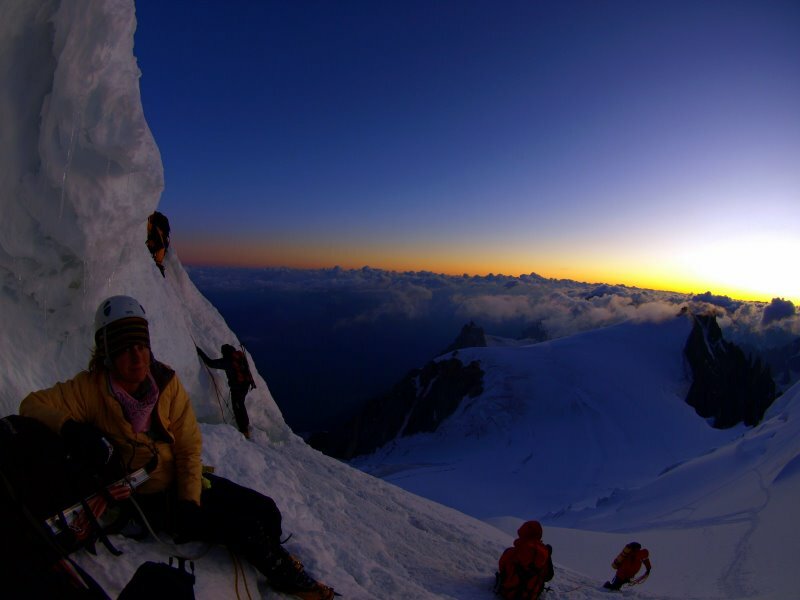 However, Kristine and I consider it to be our 8th summit if there were to be one as Mont Blanc was one of the 7 summits before Russia was considered part of Europe and Mt. 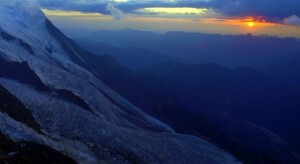 Elbrus became Europe’s highest peak. 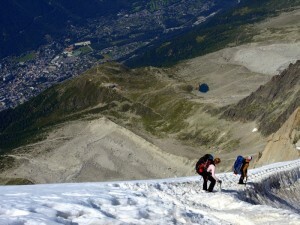 We thought Mont Blanc to be much more interesting, exciting, and technical than Mt. Elbrus even though it is close to 3,000′ shorter. 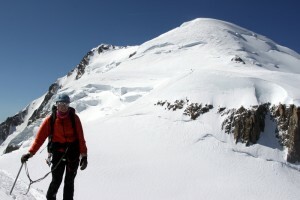 Nevertheless, Mont Blanc is not considered one of the fabled 7 summits, but remains the top of the Alps and is a fantastic mountain in itself which we thoroughly enjoyed.